Delta Fastener Corp. can provide a wide variety of fasteners, duplex nuts, duplex bolts, sockets, washers and more in Duplex Stainless Steel. If we do not have your duplex stainless steel item in stock (Inch or Metric) we can have these manufactured to your specification. Duplex stainless steels are called "duplex" because they have a two-phase microstructure consisting of grains of ferritic and austenitic stainless steel. 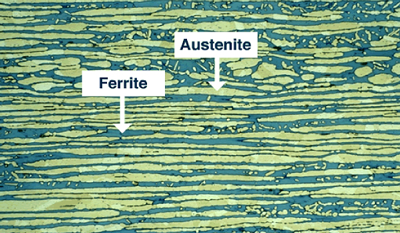 The picture shows the yellow austenitic phase as "islands" surrounded by the blue ferritic phase. When duplex stainless steel is melted it solidifies from the liquid phase to a completely ferritic structure. As the material cools to room temperature, about half of the ferritic grains transform to austenitic grains ("islands"). 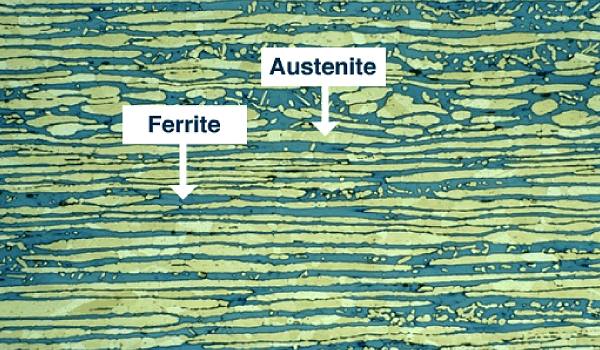 The result is a microstructure of roughly 50% austenite and 50% ferrite. Duplex stainless steel is about twice as strong as regular austenitic or ferritic stainless steels. Duplex stainless steel has significantly better toughness and ductility than ferritic grades; however, they do not reach the excellent values of austenitic grades. As with all stainless steels, corrosion resistance depends mostly on the composition of the stainless steel. For chloride pitting and crevice corrosion resistance, their chromium, molybdenum and nitrogen content are most important. Duplex stainless steel grades have a range of corrosion resistance, similar to the range for austenitic stainless steels, i.e from Type 304 or 316 (e.g. LDX 2101©) to 6% molybdenum (e.g. SAF 2507©) stainless steels. Duplex stainless steel shows very good stress corrosion cracking (SCC) resistance, a property they have "inherited" from the ferritic side. SCC can be a problem under certain circumstances (chlorides, humidity, elevated temperature) for standard austenitics such as Types 304 and 316. Duplex stainless steel has lower nickel and molybdenum contents than their austenitic counterparts of similar corrosion resistance. Due to the lower alloying content, duplex stainless steel can be lower in cost, especially in times of high alloy surcharges. Additionally, it may often be possible to reduce the section thickness of duplex stainless steel, due to its increased yield strength compared to austenitic stainless steel. The combination can lead to significant cost and weight savings compared to a solution in austenitic stainless steels. Information provided by International Molybdenum Association.